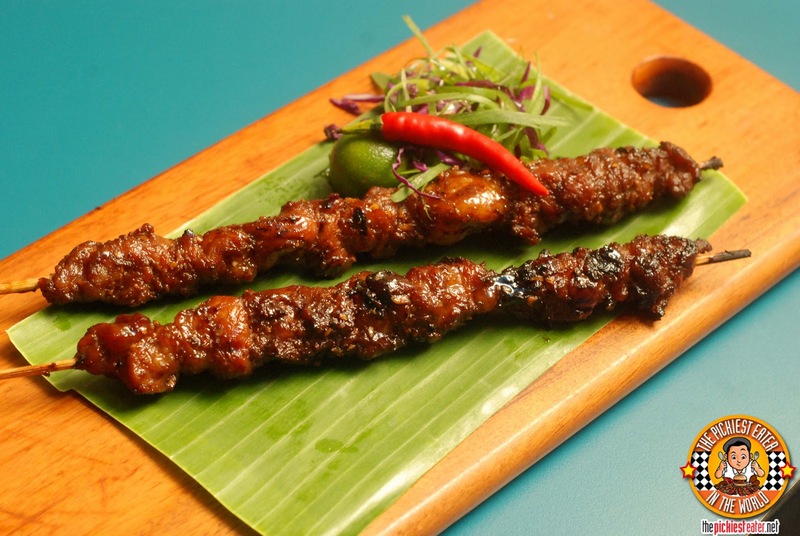 THE PICKIEST EATER IN THE WORLD: SMOKING HOT BarBQ: GLOBAL FILIPINO CUISINE AT GREENBELT 3! 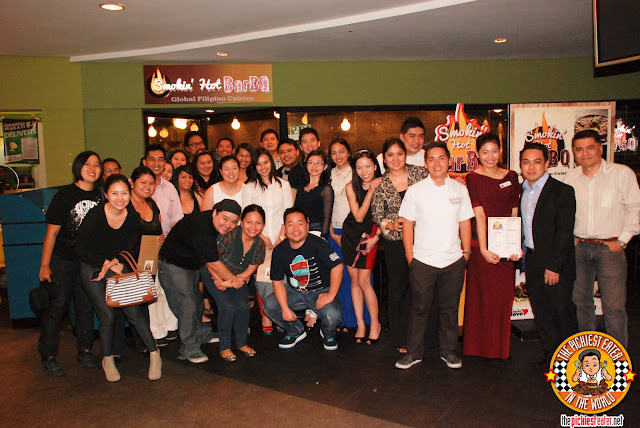 SMOKING HOT BarBQ: GLOBAL FILIPINO CUISINE AT GREENBELT 3! I'll admit that i'm not the biggest fan of Filipino Food. 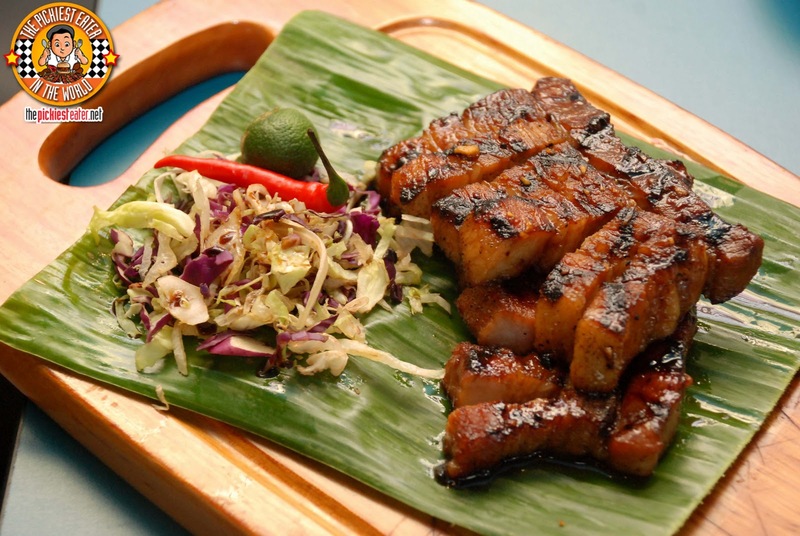 Whenever we go to a Pinoy resto, my default order is Inihaw na Liempo (Grilled Pork Belly) and i'm good to go! 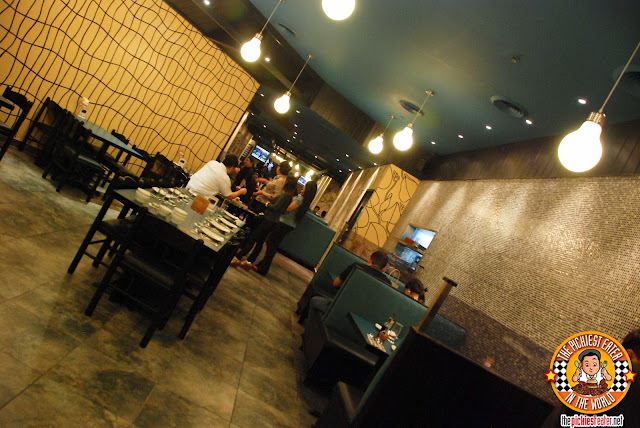 But I had an eerie feeling that Smokin' Hot BBQ, the new Filipino restaurant by The Bistro Group, would be definitely something worth checking out. Going to Smoking Hot BBQ was a little bit bittersweet for me because it meant having to finally come to terms with the closing of fish and co.'s Greenbelt Branch.. A personal favorite of mine. Imagine how I felt.. The restaurant that serves the best fish and chips in town is being replaced by another whose cuisine i'm not too fond of. Hurts, right? Nevertheless I decided to put my faith in Chef Josh Boutwood, and trust that he would do amazing things with Filipino Food. And boy, was I right. 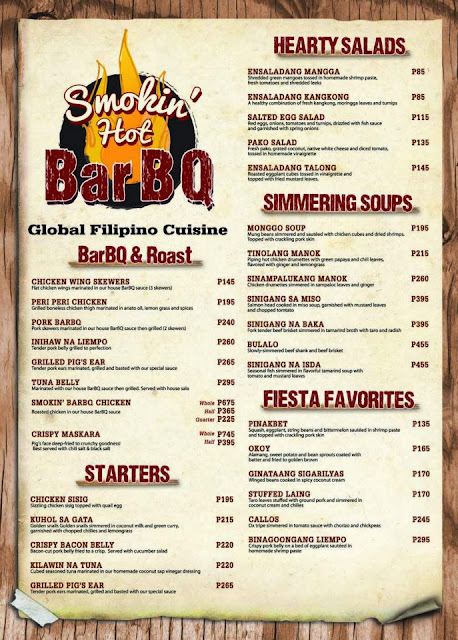 I think the problem with "Smoking Hot BarBQ" is that the name doesn't give you an inkling that it's a Filipino restaurant (Apart from the part that says, "Global Filipino Cuisine"). I took a few of my friends there a few weeks back and expected it to be a grill/steak house sort of like Tender Bob's. My buddy Mel nearly blew a gasket when he saw the amazing lineup of Pinoy dishes in their menu (Nonetheless, the name had me at "BBQ"). I'm not sure if it was an optical illusion or if they really managed to extend the dining area, but the place looks so much bigger than it was when it was fish and co.. The interiors maintained a casual, yet classy feel at the same time. Subdued green tones with artistic yellow hues adorned the walls, giving it a relaxing ambiance. We started off the meal with two things I don't eat. 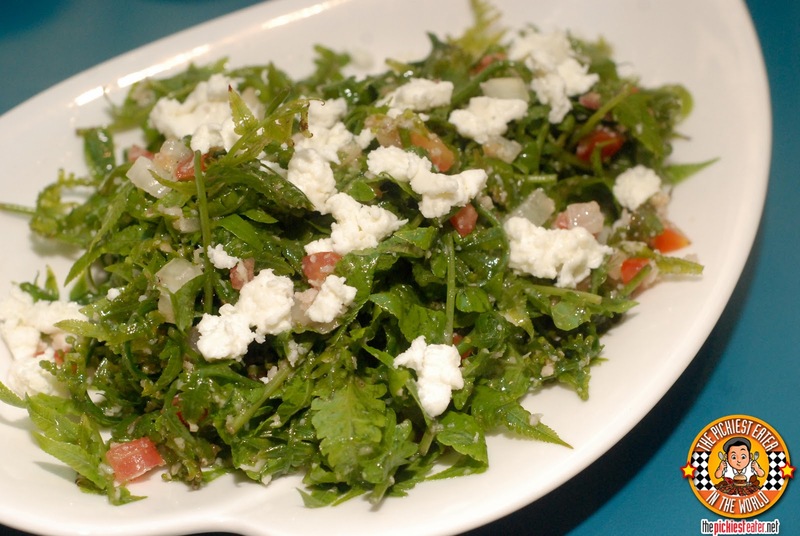 And Pako Salad (P135). Truthfully, I had no idea what "Pako" was until this day (apparently its some sort of wild fern). All I know is that it was green and had tomato in it, so it wasn't really very appealing to me. 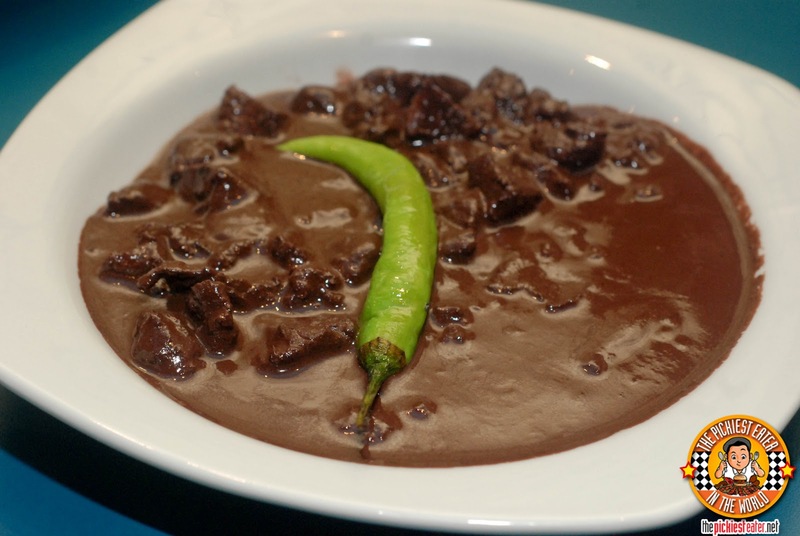 I wouldn't be the Pickiest Eater In The World if I told you that I ate the Kuhol Sa Gata (P215). 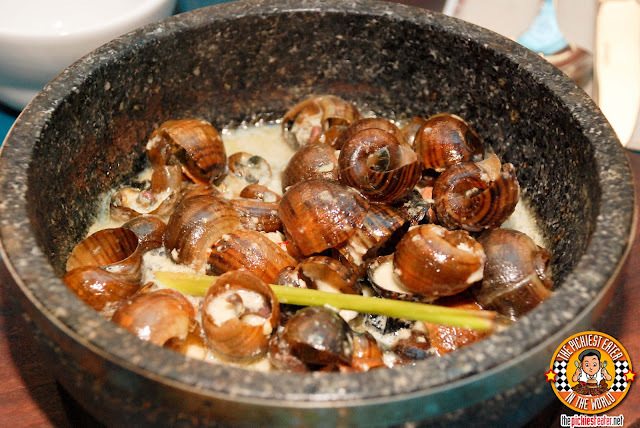 I don't find the thought of eating snails (or whatever Kuhol is) very appetizing. But everyone else was raving about it, including Rina. I did however mix the gata sauce into my rice and found it to be amazing! 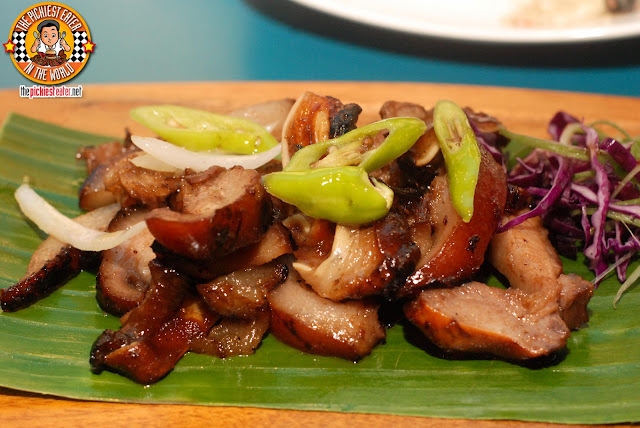 I'm aware that pork ears are part of sisig, However, I've never actually tried it by itself. I found Smokin' Hot BarBQ's Grilled Pig's Ear (P265) to be quite tasty, especially since it was marinaded in a lightly sweet sauce. I had no idea that pig ears seemed to be a bit fatty (not that I'm complaining). It was topped off with slices of Sili (Chili) to give it a touch of heat. Delicious, but I'm curious how it would taste if the skin was made a little bit crispier. 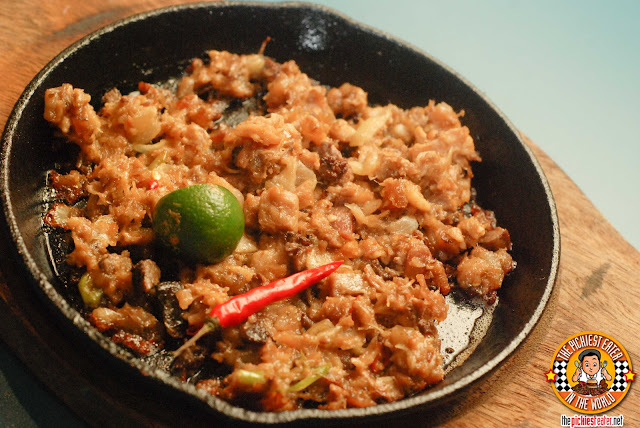 I can't stand sisig that tastes too much like liver, and not enough meat to it. Thankfully, Smokin' Hot BarBQ's version doesn't fall under that category. 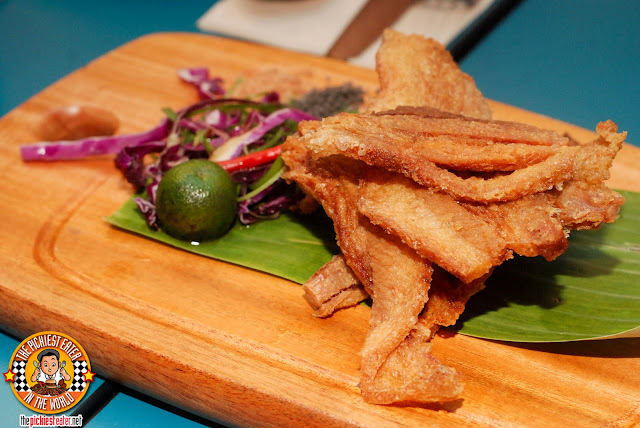 Bits of pork sprinkled with a nice helping of Chicharon (Crunchy pork rinds). 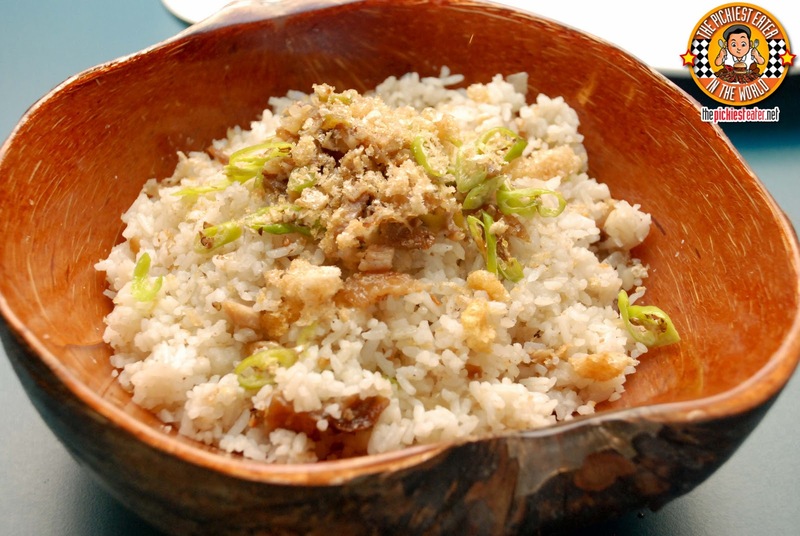 But this isn't your usual Sisig. It's delicious with rice, no doubt, but Smoking Hot added a new delightful twist. 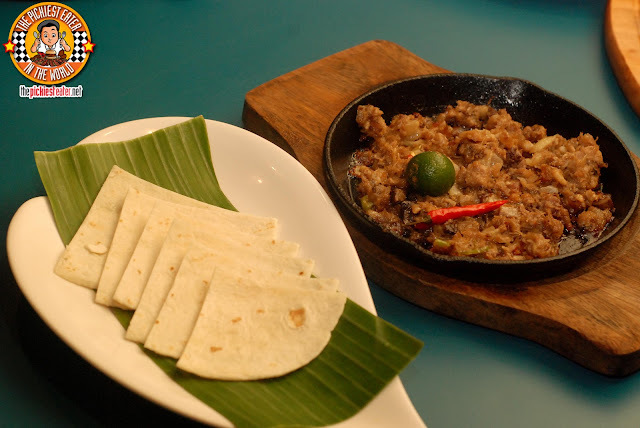 Smokin' Hot BarBQ's Sizzling Sisig is served with a side of Grilled Tortillas, turning your Sisig into a "wrap"! 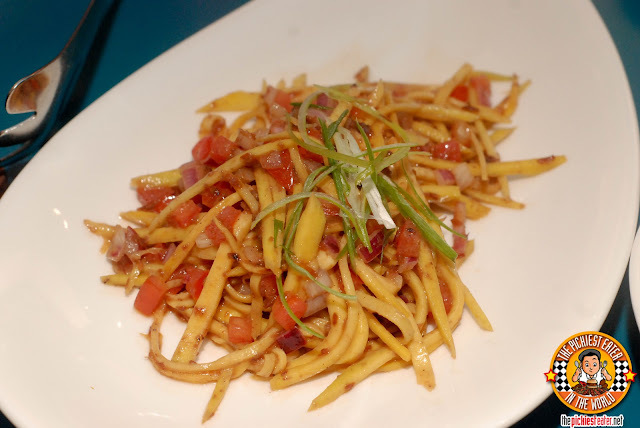 The star of the Starters Menu was Crispy Bacon Belly (P220). Thin slices of Pork Belly deep fried to a beautiful golden crisp. You add a bit of the black salt that is on the side for an added punch of saltiness that'll leave your taste buds wanting more. It's funny how this is listed as a "Starter", because if someone gave me this with rice for lunch, i'd be one happy camper. A funny and totally useless factoid about me is that, I'm not a heavy rice eater.. unless it's a form of fried rice. Sure, like any normal red blooded Filipino, I eat steamed white rice with my meal, but I'd be more than happy to substitute it for some form of pasta/noodle/bread/potato dish. Except fried rice, such garlic, or yang chow and the like. 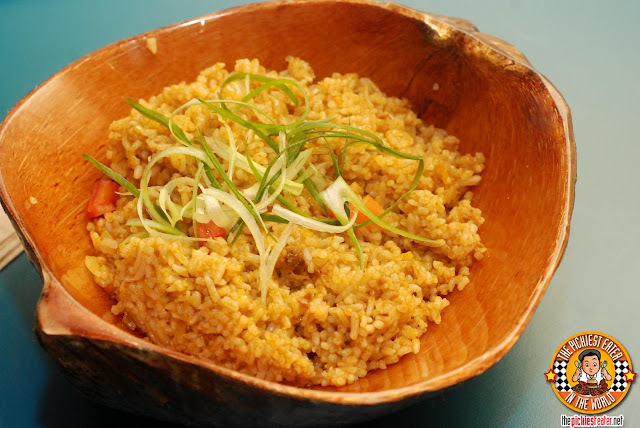 I don't eat crab, so I skipped the Aligue Rice (P135), which is fried rice mixed with crab fat and tomato. However, this was Rina's rice of choice for the evening. I also passed on the Black Rice (P190) which had squid ink mixed into it, with bits of Chicharon. Of course I know people love squid ink, but I don't know how I feel about eating a substance that was meant to be used as defensive countermeasures against other animals. 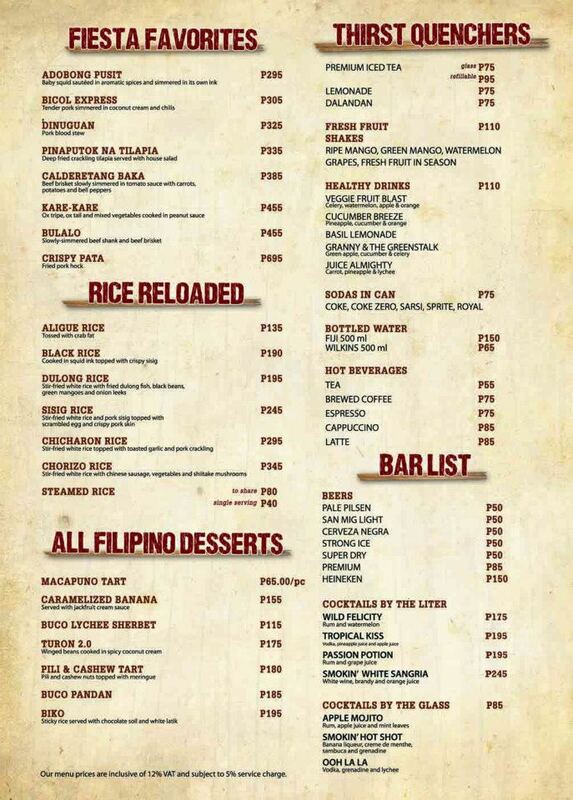 Oddly enough, my weapon of choice for that night, was the Dulong Rice (P195). It was fried rice topped off with crispy dulong fish, with black beans and green mango strips. It had the right saltiness that tickled the senses just subtly enough to not overwhelm your main course. However, something that wasn't available that night, but I was able to try during my return visit to Smoking Hot BarBQ, was the Sisig Rice (P245). 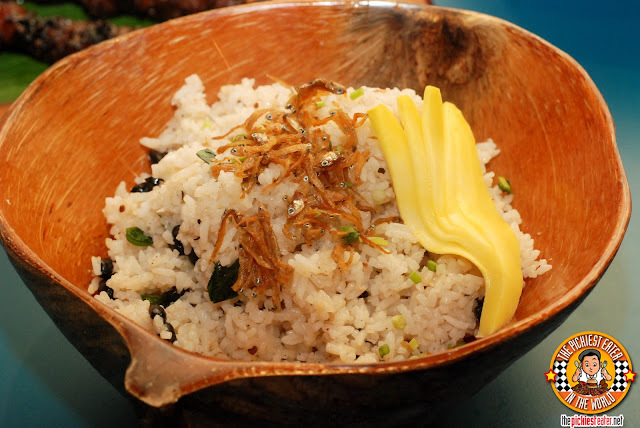 This instantly became one of my favorite rice dishes EVER. It had bits of sisig mixed into the fried rice, that was garnished with chili, giving it a bit of a spicy kick. Funnily enough, despite the fact that I don't normally go for spicy dishes, I found myself downing glass after glass of water, because the amount of heat was perfect for this dish. A few friends found this a bit oily, but guess what? That's what sisig is. I strongly recommend you try this when you go to Smoking Hot BarBQ. 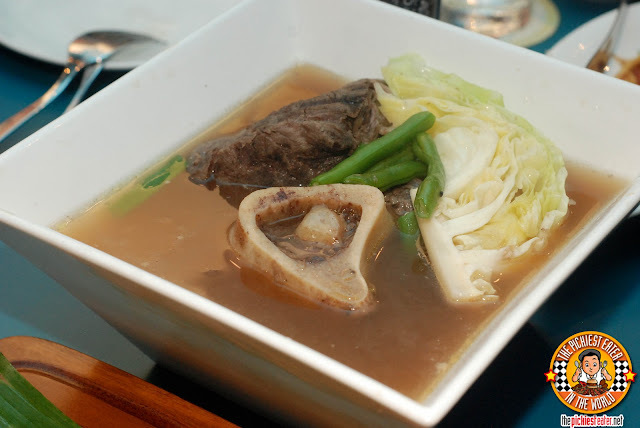 With its savory broth and its tender Beef Shank, gorgeous amount of bone marrow, and healthy amount of vegetables (there had to be a half head of cabbage in there), the Bulalo (P455) was a hit. 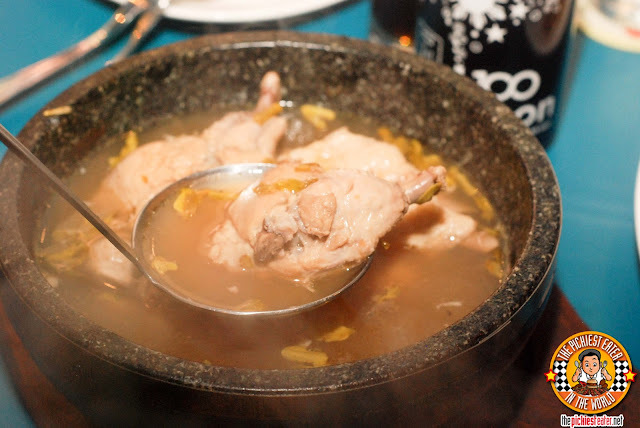 If you like your soup with a bit of a tart kick to it, then you'll enjoy the Sinampalukang Manok (P260). Nice pieces of Chicken Drummettes bathing in a soup that was simmered with sampaloc leaves and ginger. A bit too asim for me (I'm worried about my acids), but I couldn't help but appreciate the amazing flavors. I think the entire table stopped in shocked when I reached over for the Pinakbet (P135) and scooped some squash and eggplant unto my plate. 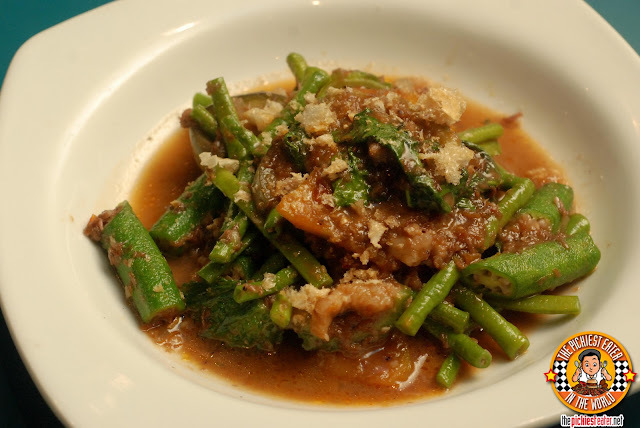 My yaya is from Ilocos, and she makes the meanest Pinakbet known to man, so this dish was quite comforting to me. It had a nice play on flavors, with the innate sweetness of the squash hitting the right notes against the saltiness of the shrimp paste (I skipped the Ampalaya (Bitter melon) though). The crumbled chicharon topping was an excellent touch, although I think a few chunks of liempo wouldn't have hurt either hehe. I don't eat Dinuguan (P325). I think I have to much respect for the meat of the pig to have to resort to eating its blood. My pale companions seemed to like it though (They were feasting on it just before they had to leave.. I couldn't make out what they were saying, but they mentioned something about the "Volturri" being on their way). To me, the real meal started when the BBQ's and other grilled dishes arrived. You don't slap on "BBQ" in the name of your restaurant if you can't put up, right? 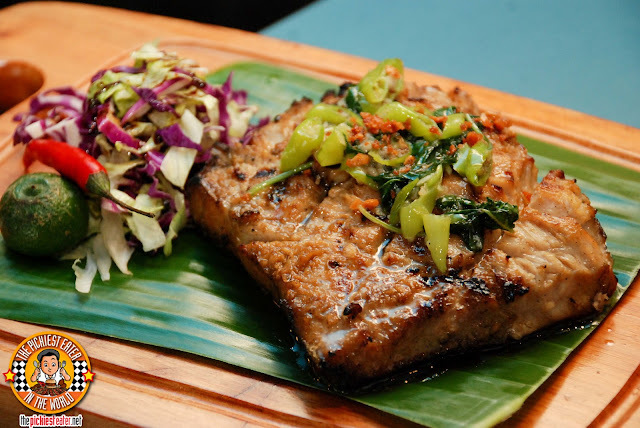 The Grilled Tuna Belly (P295) was something that I didn't expect to enjoy as much as I did. I often worry about grilled fish dishes, because it has the tendency to go dry if not correctly, but this was extremely juicy to the bite, and the delicious flavor of the fish was accentuated by the chili topping. One of the best Tuna Belly dishes I've had in a very long time. 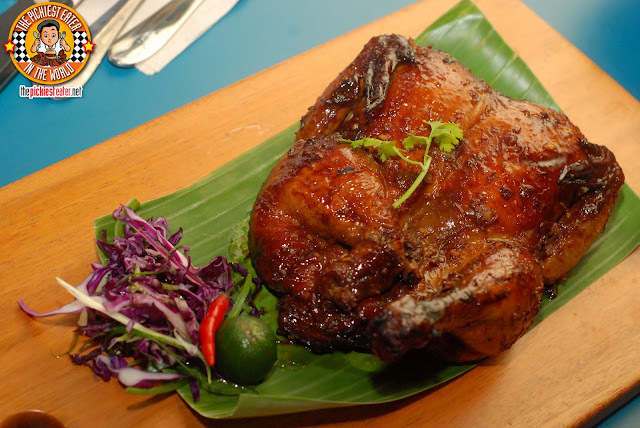 One of their signature dishes, is the Smoking Hot BarBQ Chicken (Whole P675/Half P365/ Quarter P225), and for good reason. The chicken was incredibly moist, which was exactly what I was hoping for. The skin was packed with Smokin' Hot's trademark BBQ sauce flavor, giving it a sweet, and smokey swirl of flavor in your mouth. I consider myself a Pork BBQ connoisseur, so I was eager to try Smokin' Hot's version of Pork BarBQ (P240 for 2 skewers). Their in-house marinade has that lightly sweet taste that I look for in a BBQ, and the flavor was spot on. But truthfully, I prefer a bit more fat on my pork BBQ, and for what you're getting it's a bit on the pricey side. Quite delicious, no doubt, but the reality is, there are cheaper alternatives out there. 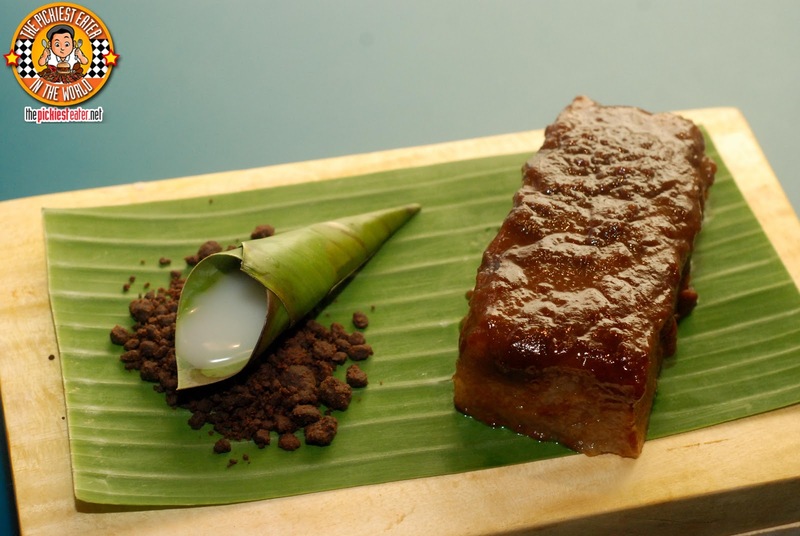 The better deal, in my opinion, would be the Inihaw na Liempo (P260). 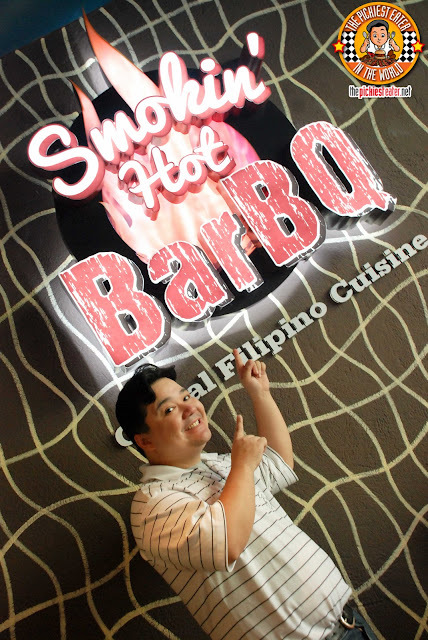 My first visit to Smokin' Hot BarbQ was in March, but I held off writing about it until I tried their liempo. I could not, in good conscience write about a Pinoy restaurant without trying their Pork Belly. Although it's admittedly a bit leaner than my preference, that signature baste just shined when brushed upon the gorgeous slab of pork. A few notches below Golden Cowrie's version in Cebu, but liempo lovers will not be disappointed. The first dessert they brought out was the Biko (P195). I won't lie to you, I'm not a fan of this native delicacy, but this was actually quite tasty. 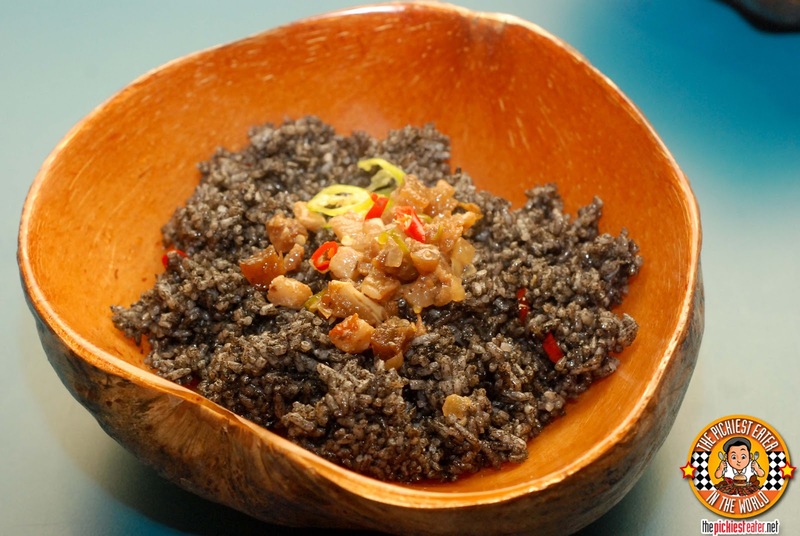 The Biko (made from sticky rice) is served with something they called "Chocolate soil" and Latik. 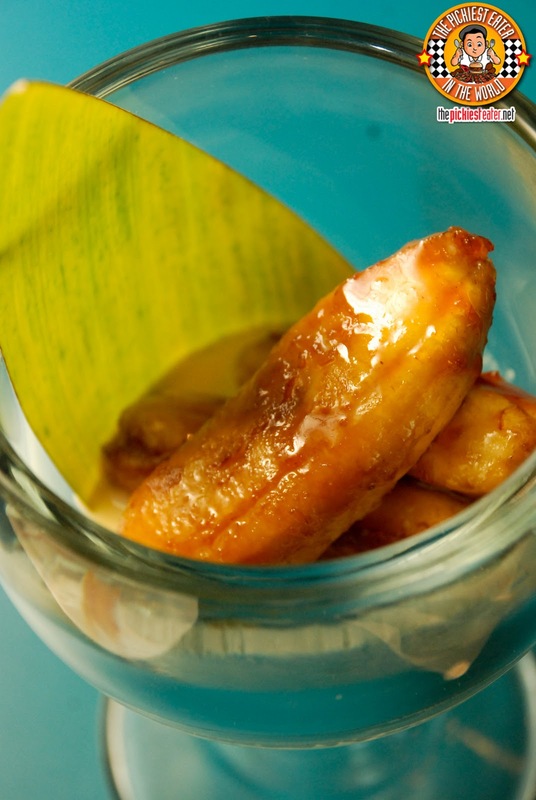 One thing that I don't recommend you try, is the Caramelized Banana (P155). I was disappointed with this, because the banana itself was a bit too hard, and there wasn't much flavor to it, even when you dip it in the jackfruit cream sauce. I gotta admit though, kudos to them for finding a way to insert a strip of jackfruit inside the banana. What I did like, however, was how the large glass helped me feel like the Dos Equis "Most Interesting Man In The World". The dessert I highly recommend, is the Turon 2.0. And I mean it. If you go to Smokin' Hot BarBQ and don't order this, you deserved to be flogged at the Town Square (Sorry, just finished a Game of Thrones Marathon). 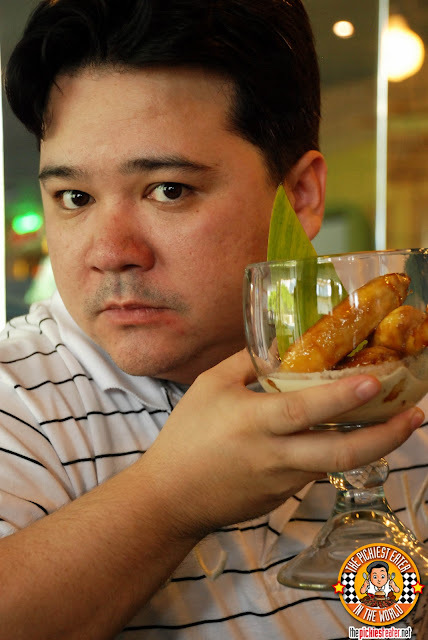 Smokin' Hot's unique take on a classic filipino dessert was amazing. 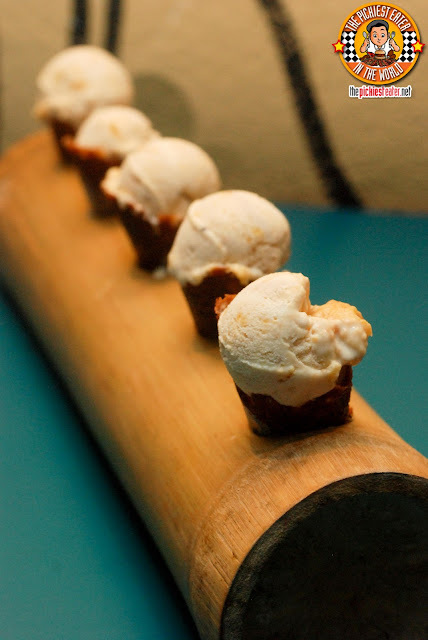 Basically, instead of a Banana, you get a scoop of deliciously creamy Banana ice cream, garnished with a bit of mashed banana compote on top, perched on top of a sugary cone. I'm telling you.. This will blow your mind. Since my first visit with my blogger friends, I've been to Smokin' Hot BarBQ around three more times. As much as I mourn the loss of Fish and Co., It's quite difficult for me to complain because The Bistro Group made sure it was replaced with another worthy Filipino restaurant. you have to try the sisig rice, im telling you!!!!! Deeelicious! And I haven't even stepped in yet! Looking forward to a pig out session there with me hub! Looking forward to your post Jaz! Snails? I wonder what the texture was like. That's quite...erm 'exotic'. :D Great blog and love all the drool-worthy photos! Haha I wouldn't know.. it was a bit too bizarre for me.. but everyone seemed to love it.. the gata sauce it was in was superb though!